..........and they said it couldn't be done !! 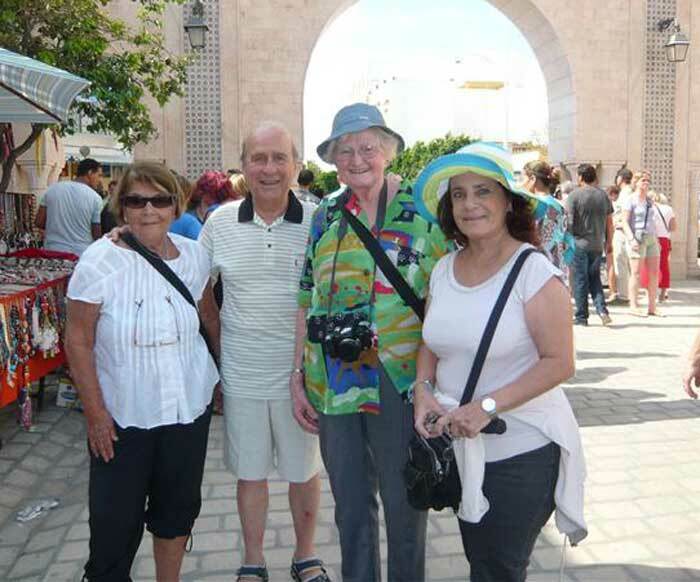 Defying all odds a 'nucleus' of the Canadian EGC/SHS contingent held their annual get-together in Hammamet, Tunisia under the newly adopted name 'Group Agamy'. Every year we seem to appreciate a slow down in pace therefore it was decided that two weeks would be adequate time to relax and enjoy our stay in Tunisia. A lively and lovely group of 22 participants were present and once again that friendly warmth for which 'Masriins' are renowned surfaced to welcome the 'new blood'. Mother Nature was most cooperative for here we were in the month of October blessed with unbelievable warm weather and we were able to bask in the sun on a beautiful beach and enjoy both surf and sun on a daily basis. Often we would lose track of the time spent in the water and it was only when looking at our shriveled fingers did we recall our childhood when our parents would call out to us to get out of the water because we had 'ghrasalla's hands' !!! We took breaks from the beach when excursions were scheduled. Boarding a pirate galleon we sailed along the Hammamet coast sighting at close range numerous dolphins. The coastline was to be a preview to the inland historical sites we were to visit. 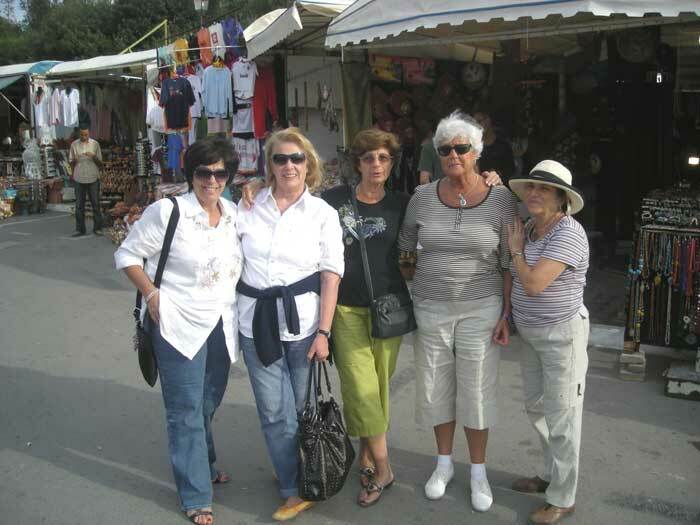 Touring the Cap Bon peninsula we visited Nabeul , Kerkouane and Korbous where we witnessed artisans at work. A visit to a Berber village was a fine example of their hospitality in their modest abode. Then on the way to Bouargoub we were treated with wine tasting at the Château Bachus. One would never expect such a large variety of wines enough to please a connoisseur’s palate. The capital city, Tunis , was a shopper's delight offering a Medina with souks in winding and never ending lanes and yes we did lose a couple of drifters nevertheless happy to find them safe and sound! No visit to Tunisia would be complete without a visit to the russet cliffs of Carthage and its numerous archeological sites. Photographic cameras were constantly 'clicking' when we reached the picturesque village in the hills that of Sidi-Ben-Said where we had refreshments served Iskandarani style, that is on the street. The well known Bardo Museum was not to be missed. There we marveled at a variety of floor, wall and ceiling mosaics which when viewed from a distance gave the impression of Flemish tapestry. Kairouan, the holy city of the Magreb was somewhat of an 'avant goût' to our visits to Monastir, Sousse and Port El Kantaoui all three well-known beach resorts. Now, an optional excursion offered, entitled "Sahara Explorer" was that of an overnight stay in the desert. Six of our group members braved the challenge and were off to a unique experience. Upon their return to the hotel their enthusiasm was such that one could sense a bit of envy and remorse in the rest of the group. It was in the evenings when we'd gather on the outdoor terrace of the hotel that their 'Explorer' experiences were shared with the rest of us. A visit to Matmata and Douz , gate to the Sahara where they witnessed a memorable desert sunset. Then on to El Djan where they visited the largest coliseum left by the Romans in North Africa then took a drive out to the Mountain Oasis of Chebika, Tamerza and Mides and finally to Tunisia's largest archeological site in Sbeitla. The many evenings spent on the hotel terrace gave us the opportunity to share laughs with 'nokats' , play games and entertain ourselves with shared moments of childhood memories, our roots ever present. One evening a very poetically inclined, talented lady shared one of her works with us. Indeed through her poem "Alexandrie" Linda Stroun revived in us a moment of nostalgia ...... the unforgettable Alexandria ! 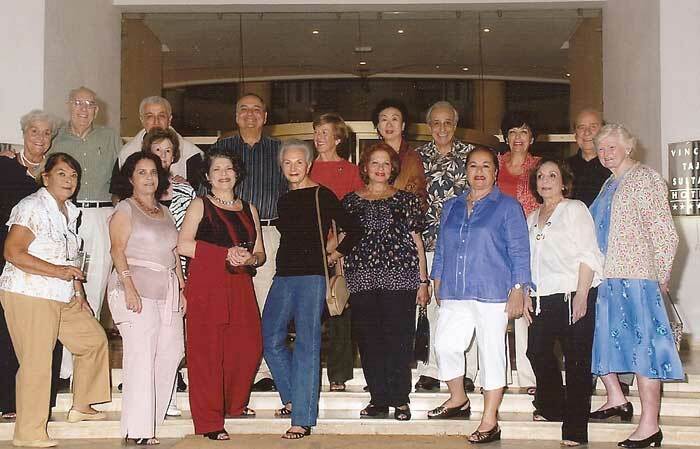 On a lighter side we could well mention that the Hammamet Casino was happy to see Group Agamy go back home simply because one of its participants had Lady Luck smile on her.......mabrouk! Happy events are always welcome and we did have the joy of sharing in the celebration of a 40th wedding anniversary, that of Margrit and David Elzik (VC) U.S.A. Quite an achievement dear Margrit and David ....inchallah mit sanaa beh saha wa salama!!! Tradition has it that we should end our get-together with a Gala Dinner which was held in the hotel's 'La Vignia' restaurant. It was an opportunity for us all to show off our Sunday's best and some music amateurs even demonstrated their singing talent by joining in a sing-along with the pianist who provided a musical background during dinner. The sharing of these two weeks of enjoyable moments in a relaxed atmosphere bonded us in a friendship that leads us to make plans for 2009. The habitual survey was conducted whereby participants voiced their opinion as to where next year's reunion should be held. Well, how about if you check with us in February, only then will we be able to inform you further. Stay tuned to our favourite website www.aaha.ch for more information. 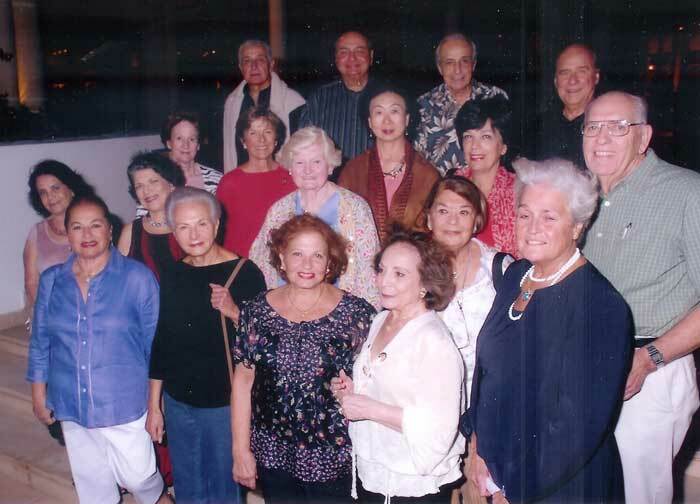 Bottom Row, L > R : Amina Hamada-Shaarawi, Djehana Hussein, Norma Malk-Kassabgi, Huguette Levy, Linda Stroun-Ichay, Diana Garabedian, Rose Sofer-Saleh, Frances (Vi) Javit. Standing, L > R : Jocelyne Assaf-Sargologo; Francesca Balestrieri-Calathopoulos; Djehane Hussein. 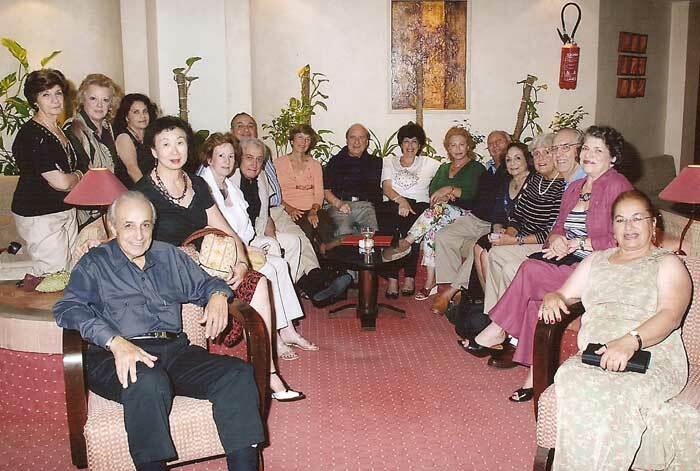 Seated, L > R : Youssef & Julie Elzik; Edith & Farouk Moussa; David & Margrit Elzik; Jack & Despina Rizopoulos; Rosmira & Robert Mussawir; Rose Sofer-Saleh; Nicole BIancardi; Richard Kimball; Norma Malak-Kassabgi; Diana Garabedian. Photo 5 : Good luck Jack with the lady shoppers !